Except for the extraordinary circumstances of President Bill Clinton’s second midterm after impeachment and President George W. Bush’s first midterm after the 9/11 attacks, the historical record shows midterm elections are always bad for the party of the President. Clinton and Bush themselves found that out in 1994 and 2006 respectively. 2010 appears to be a continuation of the normal trend, and Democrats all over the country are unusually weak. Reid is no stranger to close elections, having beat out now-Senator John Ensign by 401 votes in 1998, but he had an easy time in 2004, outperforming John Kerry by 96,000 votes to win 61-35 while Kerry lost 48-51. This year though, the polls suggest he won’t beat out a national Republican trend. Rasmussen has Sue Lowden beating him 54-39, Sharron Angle winning 51-40, and Danny Tarkanian pulling ahead 49-42, each with a margin of error of 4.5%. Winning percentages from my model: 95, 88, and 78 for an average of 87%. 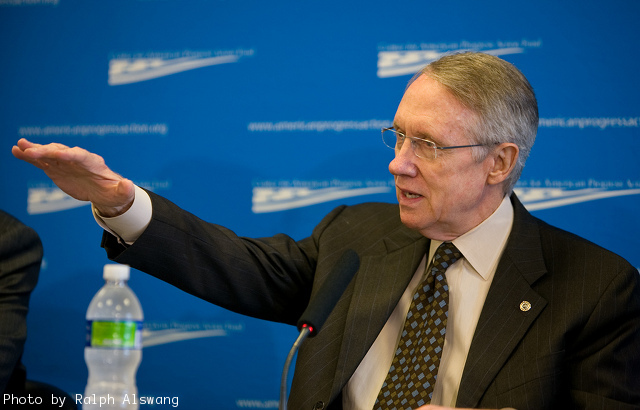 Additionally, Reid has not led a single poll in the Real Clear Politics database for this race. Senate floor leaders for the Democrats seem to be an endangered species.